A short musing on places in this world that are "between" nations' boundaries. That's not totally accurate - places where people stay when they are not recognized as officially being somewhere. Refugees, asylum seekers, detainees, displaced - the categories are well known. And depending on the whims of reporting, some of the places where these categories of people are found receive the international spotlight. Still, a few have bubbled to the surface the past few weeks that remind Teatree of perhaps a larger number than we typically think about. Airport transit zones - the US citizen Edward Snowden remains "trapped" in an airport in Russia. He's looking for a country that would grant him asylum, in order to avoid prosecution from the US government for spying, or leaking secrets. Some Latin American countries - Venezuela, Bolivia, Nicaragua - have offered him various degrees of guarantees of refuge from the US reach, but he has to get there first. Regardless, living in an airport transit zone is one of those "inbetweens." Embassies. Snowden was receiving counsel on seeking asylum from another well covered individual Julian Assange who is living in the Ecuadorian embassy in London. Embassies are considered "national soil" of the country they represent, though they are clearly situated on land that is part of whatever nation they are in. Teatree understands that the situation is known as a "construct" - an artificial frame of reference that everyone involved agrees to and mentally accepts for their mutual benefit. Refugee camps - pretty familiar. Land in a country that is adjacent to a conflict (such as in Syria) where hundreds of thousands flee for safety. The host government attempts to set up rudimentary refuge: tents, water, latrines, in order to reduce the misery of those who have fled. Refugee camps have also been established at times for streams of people leaving political oppression rather than straightforward violence. Illegal immigration asylum centers - these are a little less familiar, though in the past two weeks two have been referenced in the news. Lampedusa is a small island between the North African coast and the toe of Italy. Thousands of migrants arrive on this island each year from a variety of countries, but since the Libyan civil war two years ago, the stream has increased. The new Pope Francis created a bit of publicity for this land by visiting it recently and reminding the world of the plight of refugees. 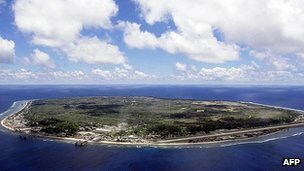 This tiny island is home to an "illegal immigration asylum center" run by Australia (photo from BBC article http://www.bbc.co.uk/news/world-asia-23387514) Nauru is apparently the world's smallest republic, population a little over 10,000. It used to create wealth by mining and processing "1,000 years' worth of fossilised bird droppings" but now depends on aid in various forms. Leasing room to Australia for its asylum center is likely one way the government saw some additional funds in its future. One of the most controversial "inbetweens" in recent years is the US terror detainee center at Guantanamo, Cuba. Here, "enemy combatants" picked up in firefights or sweeps connected with the "war on terror" are held in indefinite status without formal charges. The truth is that these individuals are often not wanted by their native countries, who are quite content to let the US take the international heat for holding them. Many detainees released back to their nations have been subsequently found again in firefights connected to jihad ideologies. Certainly much of the Western world takes soil, status, and place as givens - not so for so many in the world. One fact that has fascinated me since I realized it, is the connection between "soil" and the U.S. Bill of Rights. As explained to me by a scholar, the Bill applies to anyone & everyone but only physically within the 50 United States. Thus Guantanamo is a work-around the rights that would automatically apply to "enemy combatants" held by the U.S.